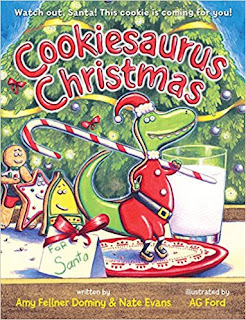 Cookiesaurus Rex may not be your usual holiday treat, but he has plenty of Christmas spirit. He would like nothing more than to make it onto Santa's cookie plate. After all, the Big Guy should have only the best cookie to take back to the North Pole. But Mr. Spatula chooses Star, then Bell, and finally Gingerbread Boy. . . . WAIT ONE STINKIN,' STOMPIN' MINUTE! Looks like Cookiesaurus Rex is going to have to take matters into his own tiny arms. Will his Christmas dreams come true, or will his holiday dreams be crumbled? This is such a cute story! Just when you think you know what Cookiesaurus wants, think again and things may change. This story shares a lot of messages. As a parent I loved how Cookiesaurus goes from thinking of himself to thinking of others and in the end he gets what he really wants. The illustrations in this book are spectacular and really bring the book to life!